Am I allowed to admit that I don't like bread and butter pudding that much? It's always too... bready. 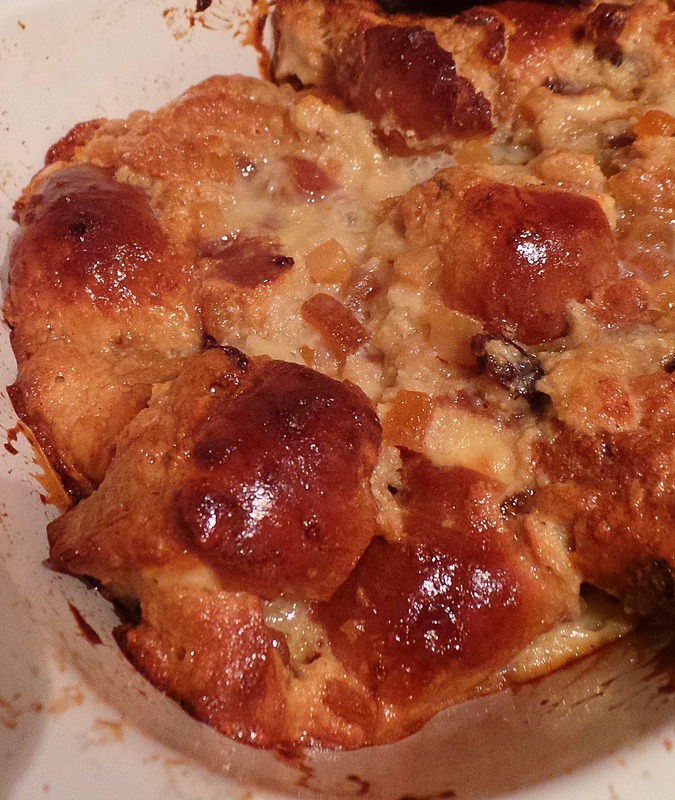 But I do love hot cross buns, and this hot cross butter pudding was something of a revelation. It's loosely based on this Krispy Kreme recipe (if I have a dozen Krispy Kremes, I'm not going to cook them), but the spices and flavours in the buns mean that you don't have to add any more. Except booze. Always add booze. You could make your own hot cross buns (which means you can make this gluten free). I bought mine from the supermarket. The cat stole one. He really should have waited until I was finished cooking, this tastes amazing. The condensed milk goes gooey and sticky and soaks right into the buns keeping the spiced pudding perfectly moist. Break the hot cross buns into quarters, try not to tear the tops. Stir the pieces in a bowl with the rest of the ingredients until they're covered in the mixture. Pop aside to soak for half an hour of so (you might not need this long, I was catching up on Broadchurch). Pour mixture into a rectangular oven dish, getting as many of the bun tops facing upwards as you can. Cook in the oven for about 40 minutes, or until the bun tops are golden brown.